Peyton Ramsey was 8 of 17 for 78 yards with an interception and added 53 yards on 12 carries in relief of Richard Lagow on Saturday. STATE COLLEGE, Pa. — DaeSean Hamilton began his Penn State career uncertain he’d ever get a chance to contribute. He’ll end it with the most receptions in Nittany Lions history. The fifth-year senior caught nine passes for 122 yards and three touchdowns and broke the school receptions mark in No. 4 Penn State’s 45-14 victory over Indiana on Saturday. Hamilton, who missed his true freshman season after a pre-existing wrist injury he was unaware of worsened during preparation for that season, teamed with quarterback Trace McSorley on the first two scoring passes. He caught the third from running back Saquon Barkley to cap the scoring in the fourth quarter after hauling in his 180th career catch earlier in the fourth to break the record set by Deon Butler in 2008. Barkley returned the opening kickoff 98 yards for a touchdown and finished with 221 yards to pad his Heisman Trophy resume. Penn State (5-0, 2-0 Big Ten) turned two first-quarter turnovers into touchdowns to spark the rout. McSorley added a rushing touchdown, Nick Scott scored on a fumble return, and Tyler Davis added a pair of field goals for Penn State. After the game, Hamilton walked into the media room with the record-setting ball sticking out of his backpack. But he’s not ready to rest on his laurels. The Hoosiers (2-2, 0-2) turned the ball over on their second play when Morgan Ellison coughed it up to linebacker Jason Cabinda after an 18-yard gain. McSorley capped an ensuing six-play, 39-yard drive with a one-yard touchdown run. Indiana fumbled it away again when Irvin Charles ripped the ball out of punt returner J-Shun Harris’ hands. Scott scooped it up and returned it 13 yards to put Penn State up 21-0 less than 10 minutes in. On his team’s next possession, Barkley made a pretty one-handed catch well behind the line of scrimmage that he turned into a 36-yard gain. It set up McSorley’s eight-yard touchdown pass to Hamilton, who made a nice adjustment on the catch over a defender four plays later. But Penn State, wearing white cleats and throwback jerseys that blended design elements from past teams, went quiet in the second quarter while the Hoosiers found some momentum with a quarterback change. Peyton Ramsey relieved an ineffective Richard Lagow and led two scoring drives. Ricky Brookins scored on a two-yard run late and Simmie Cobbs caught an 18-yard scoring pass from Ramsey to cut Penn State’s lead to 28-14 before halftime. Ramsey was 8 of 17 for 78 yards with an interception and added 53 yards on 12 carries. Penn State lost star tight end Mike Gesicki to an apparent upper body injury in the second quarter. Gesicki turned upfield after a short reception and took a hard hit from Indiana’s Tegray Scales. Gesicki walked slowly to the sideline, jogged briefly and ducked into the team’s medical tent. He emerged shortly thereafter but did not return to the game. Indiana entered the game with eight players questionable and another out indefinitely. They lost a few more, including playmaking return man Harris who was hurt on the muffled punt return. Offensive lineman Brandon Knight, tight end Ian Thomas and safety Chase Dutra all also left the game with unspecified injuries. 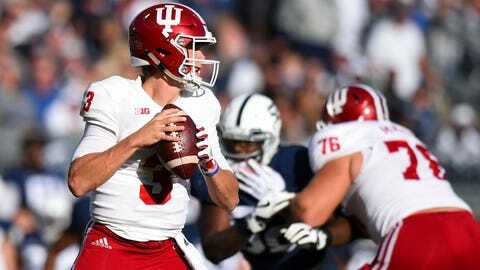 Indiana: The Hoosiers were done in by an awful first quarter, but their defense was able to keep Penn State’s dynamic offense off balance for much of the second quarter. The Hoosiers might have a quarterback decision to make as Ramsey outplayed Lagow. Penn State: For the second straight game, the Nittany Lions looked shaky on offense for stretches. The offensive line struggled to protect McSorley as Indiana threw a few different blitzes at him for five sacks. Meanwhile, nearly every yard Barkley gained on the ground was hard-earned as he had little room to run inside all afternoon. Penn State will need to find ways to create more push for its running game as the weather turns cold. Indiana hosts Charleston Southern on Saturday. Penn State plays at Northwestern on Saturday.